One of my favorite fall meals is roasted (or barbecued) pork loin. Two years ago I came across a basic recipe for roasted pork loin in Real Simple magazine and I haven't looked back since. In honor of my fading summer garden and the chill in the Delaware air, I'm sharing the recipe for roasted pork loin with cornbread stuffing. There are some special tools necessary for this recipe: a meat tenderizer and a meat thermometer. I wouldn't attempt his recipe without these tools, and you can purchase both for under $10. I purchase my pork loin on sale ($1.99/lb.) in large, 10-12 lb. loins. I cut the loins into 3 lb. pieces and use my Food Saver to freeze them for future meals. This recipe uses a 3 lb. loin. It took nearly 90 minutes to bake this thick loin, so I also recommend using a pork tenderloin of similar weight. 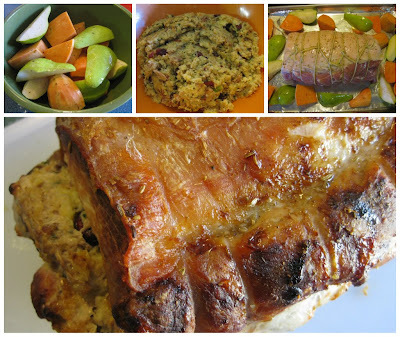 If you've never stuffed a pork loin, I found this collection of web clips helpful. 1. Butterfly the pork loin (watch the video clip mentioned above). 2. Brine the pork according to the directions in the Neely's recipe. 3. Follow the recipe exactly as stated, but stuff and tie the pork loin with the cornbread dressing (since you're not making pork chops!). 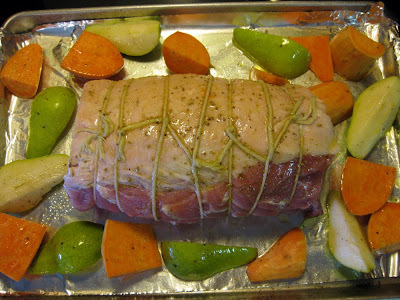 Roll the pork loin, rub it with olive oil, and tie it up... 4. Bake at 400 degrees until internal temperature reaches 160 degrees.5. Let it rest for 15 minutes, then slice and serve.